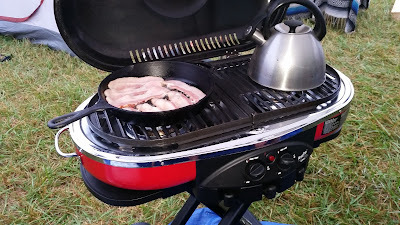 The day started with some bacon and eggs... and rain. John uses a bit of a salt to clean his cast iron skillet. One cool thing, which John might have shown me last year but I forgot, is that you can use salt to help clean a cast iron skillet. Just pour some salt into the skillet and then take a paper towel to wipe it up. Tents are wet from the rain. After breakfast, we just sat around for a while relaxing in the rain. Oh, and enjoyed some Bloody Mary's thanks to John and Lauren who brought along a Bloody Mary mix and some alcohol (complete with celery sticks!). Eventually the sun came out and we were drinking beer and back to playing corn hole. Thursday is the first day of the festival and bands play begin playing later in the day, so we had plenty of time to spare. 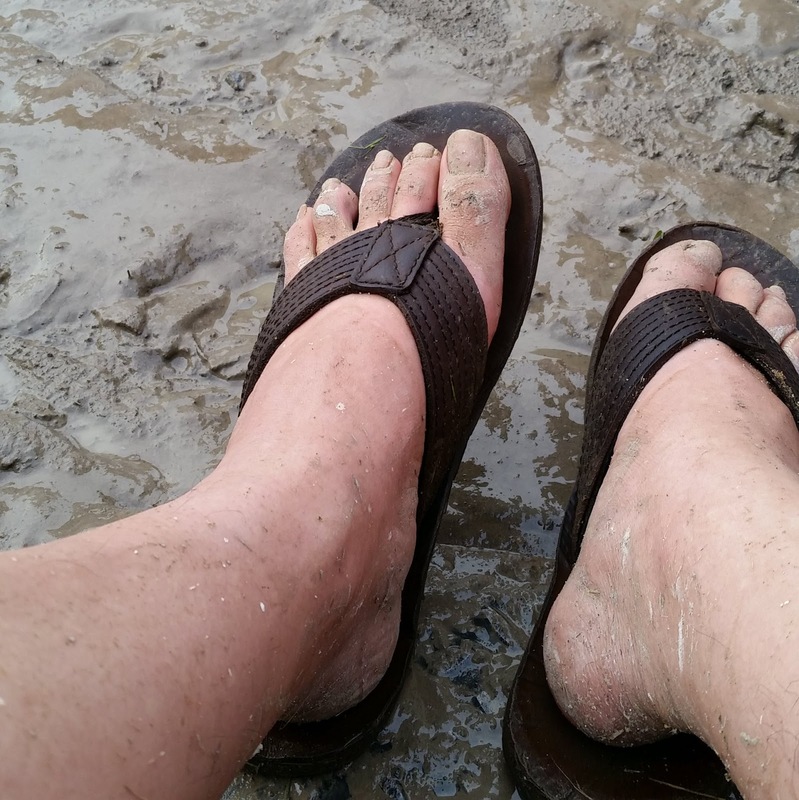 When the time did come to enter the festival grounds, we found it pretty muddy, but bearable. To start things off we listened to Young Rising Sons. 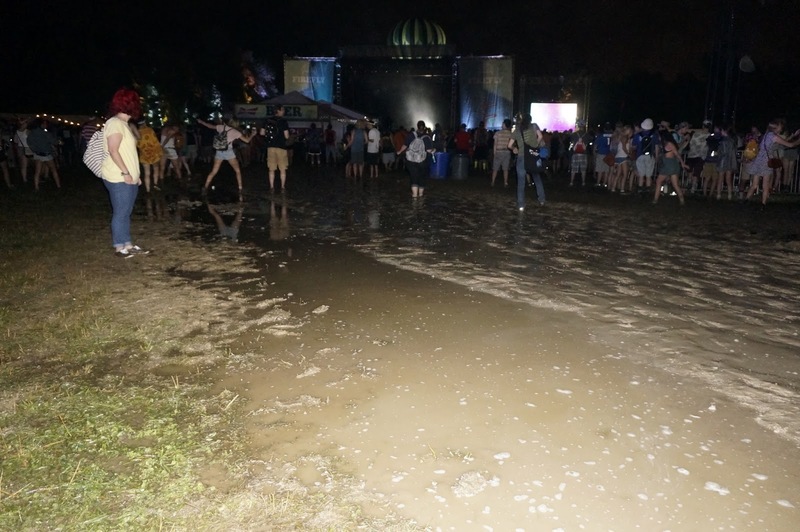 Some areas on the festival grounds created pools of mud. While these pools repelled the majority of people, some people happily danced around in them. After Young Rising Sons, we saw Hey Rosetta! and Grizfolk. Compared to other times during the festival, this is clean. It would help to have rain boots or go barefoot, but even some people wearing shoes happily trekked through the mud in order to get a good view of their favorite artist. 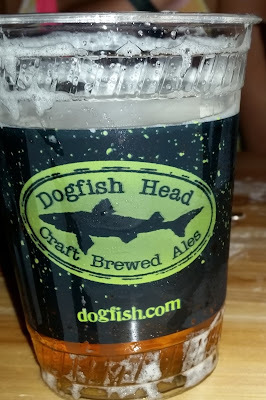 After Grizfolk, my friends and I had some time to spare and we went to The Brewery presented by Dogfish Head. There we each got a Dogfish Head Firefly Ale, an English-style pale ale brewed specially by Dogfish Head for Firefly Music Festival. A little Dogfish Head Firefly Ale. While in The Brewery, I also took the opportunity to charge various devices: my phone, a portable charger, and one of my camera batteries (I have the original battery and two spares, but I recharge any camera battery that's been used to make sure I always have at least two batteries worth). A gigantic pool of mud cutting right through a chunk of The Lawn Stage. After a good break, we started making our way back through the mud towards The Lawn Stage to see Jungle. 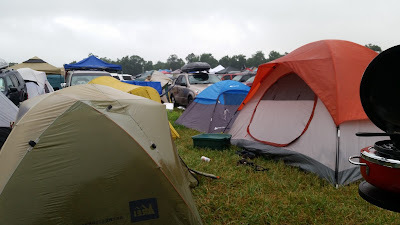 While we saw all of Young Rising Sons, Hey Rosetta!, and Grizfolk, we left towards the end of Jungle to see X Ambassadors, left X Ambassadors to see Tycho, and I left Tycho to see the end of The Kooks.